living room with sofa bed for 2, dining room and open kitchen. Private covered parking 5min walk. Great location and comfortable apartment in the heart of Amboise! I was traveling with two of my girlfriends for a week in the Loire valley and we wanted a centralized base to do day trips from. This apartment was great. Very clean and spacious and the host greeted us upon arrival to show us the place and the parking spot. We even received a free bottle of champagne! Very quiet and decent sized bathroom (since we were used smaller ones from the rest of our trip) The apartment is a short walk around the corner to the castle in town and you can see part of it from the window. There were plenty of restaurants the street over as well as bakeries and small cafes. Would highly recommend staying here and would definitely stay again if I was in the area. Clean, great location. Walk to Castle, dinner, cafes. Up 2 flights of stairs. 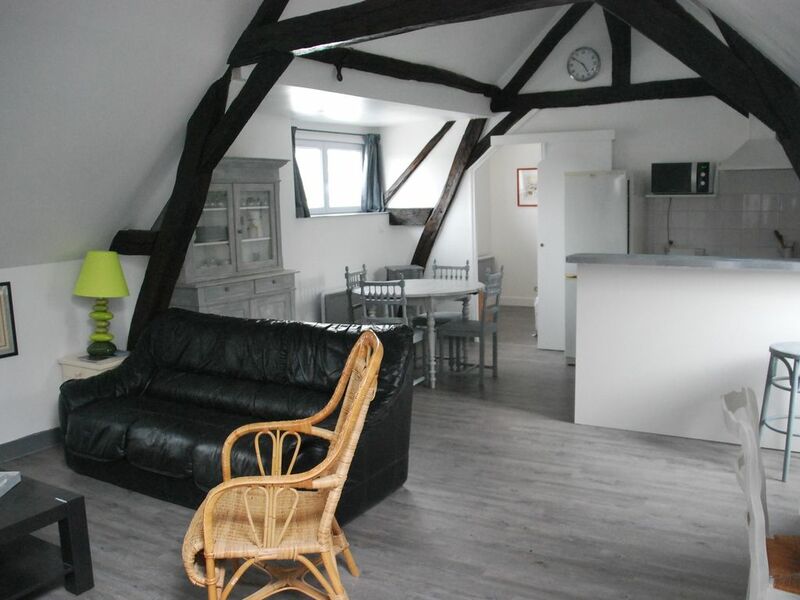 Beautiful Apartment in Amboise! Great Location! We loved our stay in the Loire Valley and this apartment was a great place to stay. I can't thank Elisabeth's friends enough for the welcome they gave us. The parking spot is "tight" but very glad to have it being my first time to Amboise and not sure what the parking would be like. It is a couple of blocks away, but a nice walk in the morning (coffee and pattisserie?) to get our car. This apartment was perfect for us and can't have wanted anything more. I would recommend this property and stay here again. Location is great. It is a clean, well organized 2 bedroom with a bathroom/shower that is accessed through the living room so you don’t have to go through a bedroom to get to it. There is a small washing machine - no dryer, but the drying rack works great. Full kitchen with a complimentary bottle of champagne upon arrival. It’s in the attic on the building (2 floors up) so it might be a little hot in the summer, but the temperature was perfect for us at the end of September. Parking is secure and we did not mind the short walk to the parking space but we also were not carrying a lot of luggage. A really cute, great apartment. This apartment is in a great location, is spotless, comfortable, spacious, and has everything you need. We would highly recommend this apartment for a stay in Amboise. This apartment is above a restaurant and I was worried it would have cooking odors and a lot of noise, but it did not. It is an upper scale restaurant, small and quiet. The restaurant does have a back patio with outside seating and the apartment's kitchen window opens directly over that patio so you can hear dinner conversation from there if you have the window open. The other side of the apartment has windows that open over the street, the street is a one-way narrow street with quite a bit of pedestrian and auto traffic and it can get a little noisy in the evenings. There is no air conditioning so you will definitely want the windows open if it is warm out. The apartment is very cute (better than the photos) and comfortable and the owner has given attention to the little details that make your stay comfortable. One bedroom has a double bed (or maybe a queen?) the other bedroom has two single beds. I used a single bed that maybe should have been replaced a few years ago but I flipped the mattress and it seemed to be better. The bathroom is modern with a shower (no tub) and a washing machine, no dryer, an iron and ironing board. Wifi was okay, I could not find any English TV stations. You have a lovely view of the castle from the kitchen window and it is only about a 3 minute walk from the apartment. I have asthma and am sensitive to smells, fragrances and mold but I did not have any problems here. Lots of bakeries and restaurants and shops in the area. Everything is about a three minute walk from the apartment: Tourist Information Office, grocery store, clothing shops, wine shops. My GPS could not find the address so I used the address of a local shop to get close. I just went into Google Maps Satellite to see the area by using the the name of the restaurant that is downstairs: L'Echanson. Elisabeth Spitz if your landlady, she is a lovely lady and very accommodating. To communicate with her you should know that she does better texting than talking on the phone because of the language barrier, her number is +33 6 40 75 15 99. You will have to carry your luggage up two flights of stairs. There is a parking garage that goes with the apartment, it is about three blocks away and I found it very difficult to park there. I was able to find parking on the street but be aware that the parking police do check often to make sure you have paid. Sunday parking is free and I was able to find a few free parking spaces in the area. Along the Loire westward available to you other famous places such as Breze, Brissac, Saumur, Montsoreau or the Abbey of Fontevrault, villages or tufa stone cave. Not to mention the homes of F. Rabelais, Ronsard P Cardinal Richelieu or R. Descartes. Tours and with its museums, its cathedral and houses dating from the time when this city was the administrative capital of the kingdom and artistic. - Marked hiking through vineyards and forests. - Indoor and outdoor pool. - Beauval Zoo and its Chinese pandas to an hour. - Overview of the region ballooning. - The large market of Amboise Sunday morning. In short, a thousand and one ways to enjoy the charm and live Loire. Charges comprises Ménage inclus 1 - Modalités tarifaires et de paiement - 'La réservation définitive sera actée dés le paiement de 25% du séjour par virement bancaire (voir ci dessous). Un courriel de confirmation sera alors délivré. Le solde du paiement sera demandé à l'arrivée, en espèces ou par chèque avec un dépôt de garantie de 300 euros qui sera restitué en fin de séjour.